Take a trip back in time in our restored vintage airplanes! 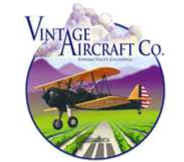 Fly over world renowned vineyards and majestic Pacific Coast! Having flown over 75 different aircraft models during his 30 year flying history, Chris still finds the open-cockpit Stearman his most exhilarating flight experience. He recently finished restoring a WWII Curtiss P-40 from a fuselage recovered in New Guinea. 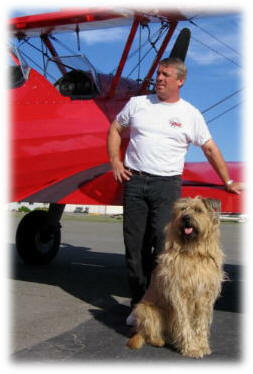 Chris is well known and widely respected in the world of vintage aircraft. He remains passionate about flying and his restoring of Golden Age aircraft from the 1920s and 1930s and the fighter aircraft of the Second World War. Tom started flying at the age of 13 while washing and fueling airplanes at the local airport for flight time in lieu of cash. He never left. Now a pilot for 37 years, Tom has a commercial pilot certificate and more than 2,000 hours of flight time, most in antique airplanes. "Hanging out at the airport," which he admits he lives for, has given Tom opportunities to fly more than 60 makes and models of aircraft. He says each has a unique personality. Tom's "day job" as a Principal Engineer for Bay Area Rapid Transit District keeps his engineering skills honed for his other passion -- restoring antique aircraft. He has restored several, and showing them all over the U.S., has received several prestigious awards for his efforts. 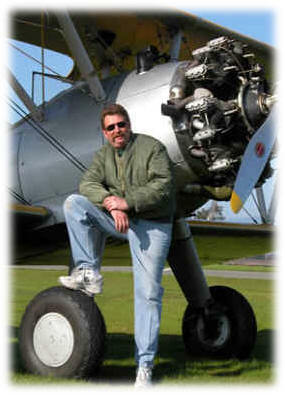 Tom has been flying for Vintage Aircraft Company for many years and delights in the joy of sharing the vintage flight experience -- evidenced by his broad smile every time a big Vintage Aircraft radial engine starts to rumble. the expressed written consent of Vintage Aircraft Company and their agents. as set forth in the United States Declaration of Independence. This determination will never be based on Race, Religion, Color or Natural Origin.